President Trump had to rush inside of his Turnberry golf course as a Greenpeace activist in a paraglider swooped in with a sign that read "Trump well below par #RESIST". The man began his three mile flight across the Ayrshire countryside at 9:30 p.m. just after Trump arrived at the course, flying under the noses of Trump's elite snipers before circling the lawn in front of the Turnberry hotel where President Trump will be staying this weekend. Greenpeace says it informed the police and air traffic control of the protest ten minutes before it was launched ("Hey so don't shoot us, it's a prank!"). Police Scotland's Assistant Mark Williams said that authorities are looking for the pilot: "We are aware a powered parachute was flown in close proximity of the Turnberry Hotel earlier this evening," adding "It is a criminal offence to fly within the airspace restriction zone and officers are carrying out enquiries to trace the pilot." 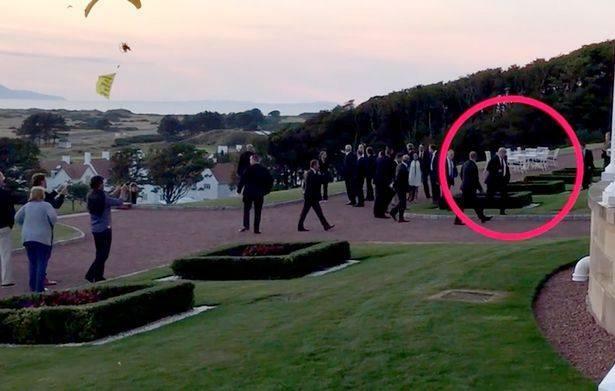 Earlier in the day, Trump walked over to the edge of his course to wave a group of protesters standing on the beach below his Turnberry resort as he and his son Eric golfed. The crowd was chanting "No Trump, No KKK, No racist USA" and "go home". British MP Liam Fox, who welcomed Trump to the UK at Stansted Airport on Thursday, said that the demonstrators were an embarrassment to themselves - telling BBC News: "The President has his own way of expressing himself and I don't think the protesters were an embarrassment to the Government. I think they were an embarrassment to themselves." "I think that when you have the President of the United States, the leader of the free world being greeted with signs that say 'go home, we hate you', I don't think that reflects the good manners and hospitality of the British people." Thousands of protesters took to the streets this week in protest of Trump's visit. Asked about the hostility he faced, Trump said "They can call me whatever they like. They can have their opinion and I haven’t offended them but they seem intent of offending me." 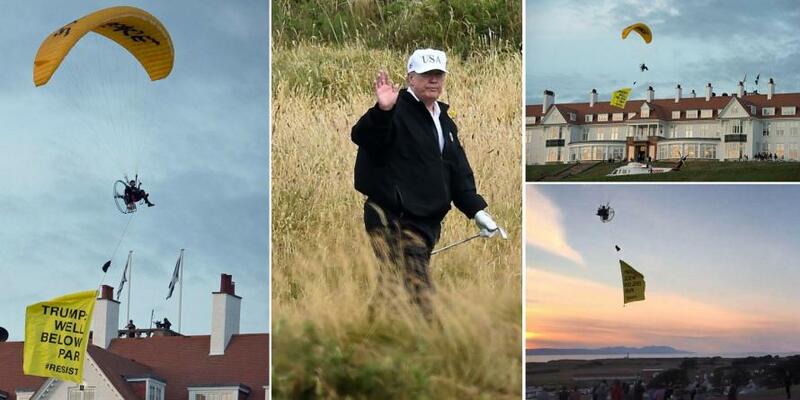 Before his first round of golf, Trump tweeted "I have arrived in Scotland and will be at Trump Turnberry for two days of meetings, calls and hopefully, some golf - my primary form of exercise! The weather is beautiful, and this place is incredible! Tomorrow I go to Helsinki for a Monday meeting with Vladimir Putin."